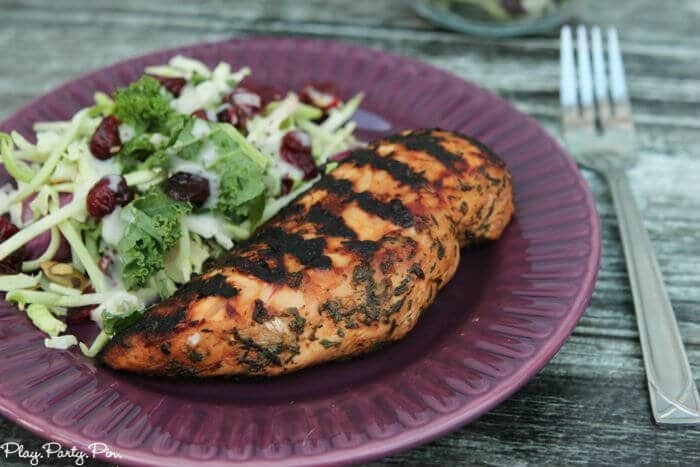 This balsamic chicken recipe with sweet kale salad is perfect for nights when you don’t have a lot of time to make a complicated meal but still want something that tastes amazing. I know you’re probably wondering why I’m talking about a salad in the middle of winter. Isn’t winter for soups, casseroles, and other comfort food? Honestly, that’s normally what we eat during the winter. In fact, I’m actually making my grandma’s chicken noodle soup for dinner tomorrow. But about once a week I just need a salad, something to counteract all the pasta and heavy meals we eat the majority of the time. And my current favorite – Eat Smart Sweet Kale salad. This stuff is amazing. 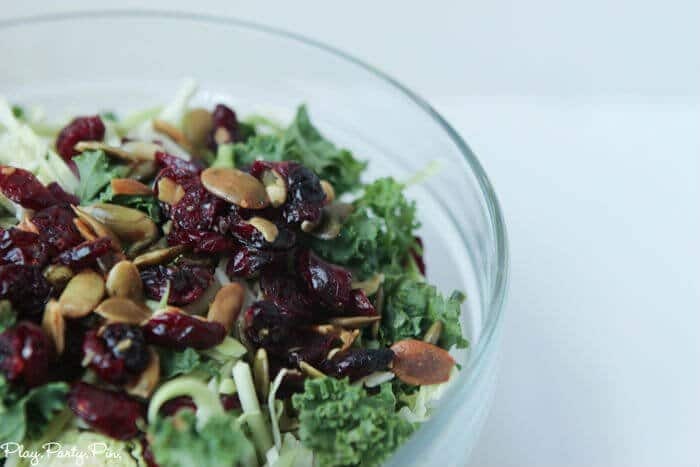 My kind of salad is one with crunchy greens, nuts, fruit, and a sweet dressing. This salad has it all, and I could seriously eat it every single day. The base is made up of non-traditional greens – cabbage, kale, chicory, and brussels sprouts – which in itself is awesome. And then it comes with a little pouch full of all sorts of crunchy goodness – dried cranberries and roasted pumpkin seeds. Top that off with the delicious poppyseed dressing, and this salad is a winner. If kale salad isn’t your thing, this cranberry orange brussels sprout slaw would be amazing with this balsamic chicken as well. 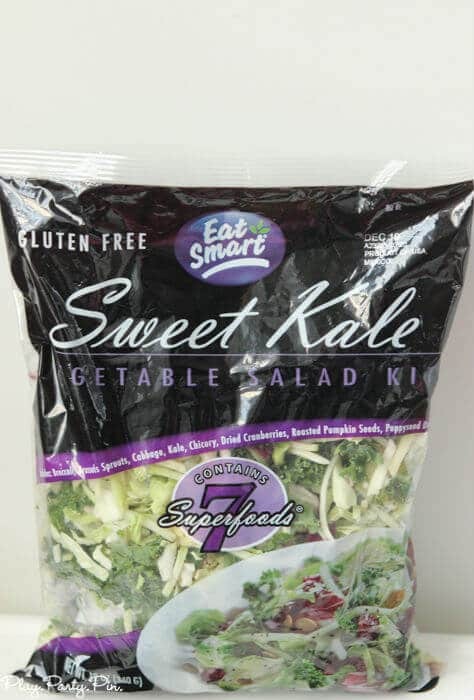 In addition to the Sweet Kale salad, Eat Smart has five different gourmet salad and stir fry kits that are full of delicious ingredients just like this one. They’re a fast and flavorful way to add veggies to your plate, not to mention they taste great. They’re perfect for a busy mom like me who doesn’t have time to chop all of those veggies for dinner. You can find a store near you that sells Eat Smart products with this store locator tool. Pick up a couple of salads and stir fry mixes to make your life a little easier this holiday season. While I could probably just eat the entire bag of salad as my meal, my husband made up his delicious balsamic chicken to round out the meal with some protein. The balsamic chicken is so easy to make. 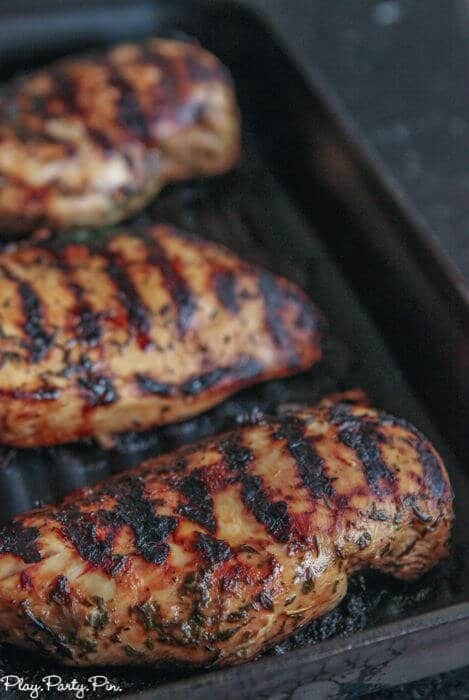 You marinate the chicken, grill it (we use a grill pan), and then just bake it in the oven. It really can’t get much easier than that. I’m one of those “my foods can’t touch” people, so I ate the chicken and salad separately, but my husband said that the two together was actually really good as well. And make sure you have extra sweet kale salad available because I can promise you’ll want more than will fit on your plate. I pretty much always get seconds. Enjoy! Combine the first five ingredients in a plastic bag or bowl to make a marinade. Season both sides of the chicken breasts with kosher salt and place them in the marinade. Marinade for at least 20 minutes. Preheat the oven to 375° and a grill pan over high heat. Grill the top side of the chicken breasts over high heat for 3 minutes, or until the chicken breasts are marked. Flip the chicken breasts and transfer them to the oven to finish cooking, for about 20 minutes. Remove the chicken from the oven and let them rest for 3 minutes before serving to allow the juices to redistribute. Mmm… this looks great! I’ve tried the Sweet Kale and the idea of adding Balsamic Chicken is fabulous! This looks like an excellent meal! This salad mix looks delish! It’s my kind of salad. I have to agree. After a week of heavy meals, I always like to throw in a light salad! Kale makes a wonderful salad. This recipe looks delicious. Oh yum! This chicken looks amazing! I think I would chop it up and put it on top of that salad. I love those salad kits! They always have flavors that I know I wouldn’t have put together on my own. What an awesome meal! Wish I had it for lunch today! This looks like a great dish and I’m thinking I need to fire up the grill even if it is the middle of winter! 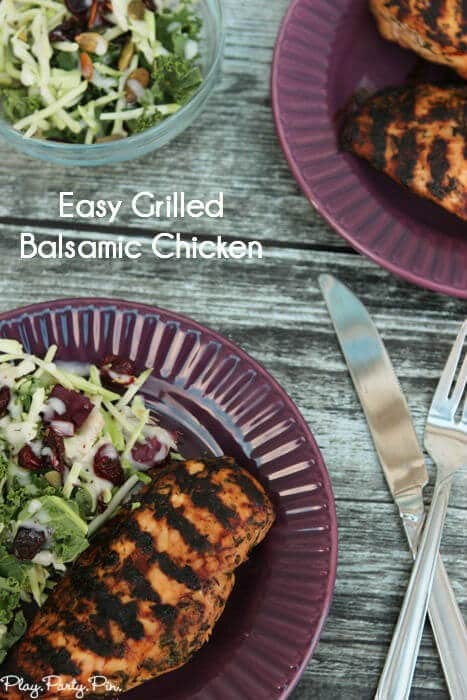 I love balsamic, but have not made a balsamic chicken. That’s a great idea. I love to lighten things up by adding a salad during the winter. I love the sound of this paired w/ the balsamic chicken. I saw the salads at the store this evening and almost bought one… You’ve convinced me! It will be on my list next time. This looks so yummy! I love balsamic. 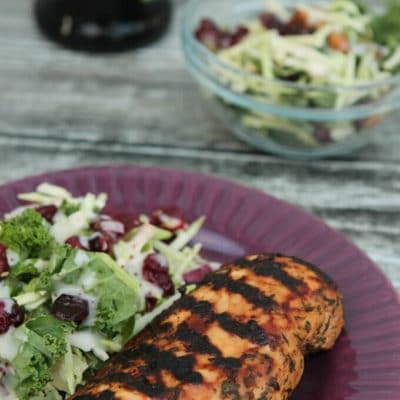 Love a grilled chicken salad and this one sounds amazing!! Kale is one of my favs! I adore balsamic and this looks delicious! This looks so delicious. That chicken seriously looks like the perfect chicken! Wow this looks extra yummy! I’ve tried this recipe several times. It’s one of our very favorites!! 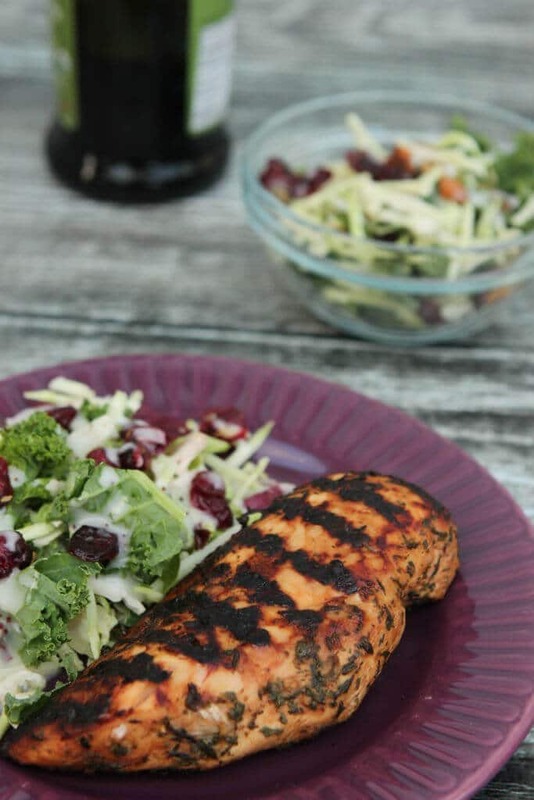 I love a good balsamic chicken recipe! It’s so versatile and perfect with this sweet kale salad.